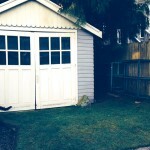 We also asked the broader community what they have tried in their gardens, and what was helpful. Clubfoot is a fungus that resembles slime mold, which is soilborne. Clubfoot is spread by contaminated transplant and tools. It creates cyst/spores that can survive for years in the soil. The cyst lies dormant in the soil 6-12 years till a live host reappears. The first signs of club foot are wilting during the day, and then yellowing leaves that die. 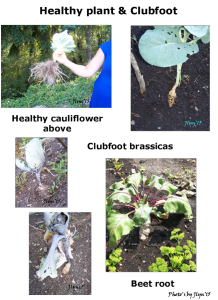 The diseased plant is stunted and when dug up, there are deformities of the roots such as knots, clusters, and sometimes black diseased areas in turnips and radishes. One web site I found says to dig up plants and sow Rye, after 2-3 weeks of germination till it into the soil, raise your pH to 7.2 mixing in Hydrated lime into it in fall. Improve your soil for drainage, continue to check pH balance. You can also “solarize” the area by putting down a clear plastic sheet(s), 1-2 mil is better than thicker sheets, between May-September to heat up the soil and it will kill the fungus if heated enough. In seed growing, be sure your soil, trays and pots and any utensils use to work with them are sterile. If any of your equipment has been contaminated by clubfoot cyst, it will continue to contaminate the cruciferae, brassicaeae family. Throw contaminated tools out. There is nothing worse than losing a crop for the season and contaminating the patch for years. Check your transplants before selling, giving or planting them out. In the patch, prevention is the best way. It seems 3-5 years is a popular number of years. In a small space, we could try for 3 years, making sure that you keep your soil to an optimum and watch how your plants are doing. Keep your soil pH between 6.5-6.8 by adding lime to the soil and when you plant your transplant, dig the hole, add a small handful of lime into the hole (to discourage clubfoot disease), mix lightly in the soil, put in the plant, cover and water. ALWAYS check any transplants you grow or buy before putting in the ground. 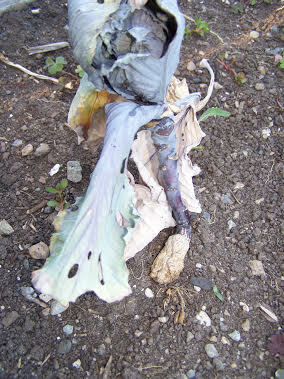 DO NOT PUT in your compost, if it is infected it will spread throughout your patch or garden or create a new problem. And many years of reading about this fungus. 1. It’s good to try to prevent getting this stuff into your soil in the first place: but it’s transmitted by pots and flats and your own muddy boots, gloves and tools (even if you just put one down on an uninfected plot after it’s rested in an infected plot you’ve carried the stuff over) and by heavy rains and by compost. Even compost which has been hot enough may still harbor the slime mold in drier places in the compost. Having said that: apparently it also prefers heavier, wetter soils to lighter, more aerated ones. And common weeds – like the mustards and cresses – can carry it so even if you’ve been quite careful you could be defeated by the weeds. Clean your tools and boots; consciously work from “uninfected” towards infected places to avoid carrying it over. If you see it in transplants: don’t plant them. 2. Strategy, strategy, strategy: Decrease the amount of it in the soil. IF you don’t grow there for quite a few years it can’t thrive and will be less of a problem – but still can be present for many years: one source said it could survive for up to 20 years. •	Solarization (know that this will kill everything.) Reportedly this only gets the stuff that’s 3-4 inches deep so you’ll need to till and do it again …. 2. Help your plants to outgrow it: Older plants may not be as affected so use larger transplants; heap clean soil around the plant to encourage healthy roots. 4. Make the environment less attractive to slime mold — because healthy soil has healthy fungi that can decrease the load of the problem slime mold. Use a good uncontaminated (and quite possibly not home-made) compost to lighten the soil. Consider raised beds which drain better or replacing the soil in your beds. This entry was posted in Featured Story, Growing Tips on July 29, 2015 by Dianne. SGGN Sprouts – Learn about our greenhouses! Since about 2008, a Wallingford Greenhouse project has grown thousands (+7000 in 2013!) of vegetable starts in a resident’s greenhouse in Wallingford. 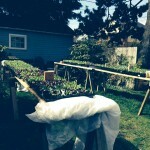 In 2012, a Ballard resident offered his greenhouse to grow starts as well. Each February, community volunteers refresh their seed-sowing skills and begin planting snow and snap peas, followed by lettuces, kales, beans, tomatoes, peppers, and other vegetable varieties that grow well in Seattle. As successions of seeds are sown in the greenhouses, winter blankets of burlap and leaves are removed from Giving Gardens in the city’s P-Patches. Two major events follow: Seattle’s Giving Garden Network Gathering and Interbay P-Patch’s Giving Garden Kick-off and kale harvest. These are where the first greenhouse vegetable seedlings are distributed. Starts continue to leave the greenhouse through July, and are distributed to waiting Giving Gardens across Seattle. The seedlings help extend the growing season and increase harvests, allowing more produce to be donated to food banks, shelters, and meal programs. Vegetable varieties are tailored to food bank requests and ensure that different cultural communities receive familiar and favorite foods. In 2013, over 29,000 pounds of fresh produce was donated directly by 64 Giving Gardens! We are always looking for volunteers and welcome volunteers at all levels – from workers in the greenhouses to planners to distribution experts ! To volunteer, please go to the CONTACT US page of this website and let us know of your interest. 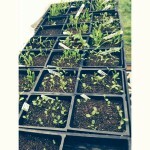 This entry was posted in Featured Story, SGGN Sprouts and tagged Greenhouses, plant starts on April 1, 2014 by Carol Tompkins.